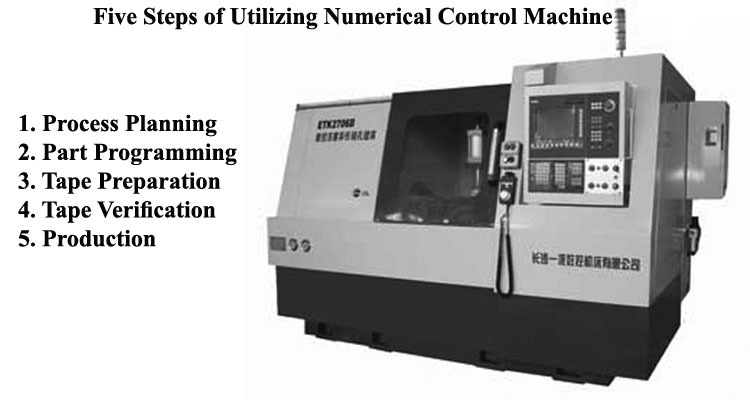 To utilize numerical control in manufacturing, the following steps must be accomplished. (a) Process Planning. The engineering drawing of the work part must be interpreted in terms of the manufacturing process to be used. This step is referred to as process planning and it is concerned with the preparation of a route sheet. The route sheet is a listing of the sequence of operations which must be performed on the work part. It is a called a route sheet because it also lists the machine through which the part must be routed in order to accomplish the sequence of operations. (c) Tape Preparation. A punched tape is prepared from the part program NC plan. In Manual part programming, the punched tape is prepared directly from the part program manuscript on a typewriter like device equipped with tape punching quality. (d) Tape Verification. After the punched tape has been prepared, a method is usually provided for checking the accuracy of the tape. Sometimes the tape is checked by running it through a computer program which plots various tool movements (or table movements) on paper. The acid test of the tape involves trying it out on the machine tool part. A foam or plastic material is sometimes is used for this trying out. Programming errors are not uncommon, and it may require about three attempts before the tape is correct and ready to use. (e) Production. The final step in the NC procedure is to use the NC tape in production. This involves ordering the raw work parts, specifying and preparing the tooling, any special fixture that may be required and setting up the NC machine tool for the job. The machine tool operator’s function during production is to load the raw work part in the machine and establish the starting position of the cutting tool relative to the work piece. The NC system then takes over and machines the part according to the instructions on tape. When the part is completed, the operator removes it from the machine and load next part.